Pour yourself a glass of ice-cold water to sip while you read this hot topic on dehydration. The definition of dehydration is that you lose more fluids than you take in—which is easier to do during these warm summer months! Many of us believe dehydration is prevented by our body’s own natural sense of thirst to remind us to pour a glass of H2O. But as your parent gets older, their sense of thirst will diminish. And if they suffer from memory loss, they may not remember to drink liquids throughout the day. Hydration is so important because it keeps electrolytes balanced, blood volume normal, aids in digestion, transportation of nutrients, and kidneys functioning. And if your parent becomes dehydrated, they have the added risk of mental confusion. How can I help to prevent dehydration for my parent? Provide them with plenty of fluid throughout the day that appeals to them, including flavored waters, plain water, juices, or smoothies. And even coffee and tea is largely made up of water (although these have caffeine) and can help hydrate to some degree. Especially during these warmer months, encourage them to drink throughout the day. Provide them with plenty of fruits (especially watermelon), vegetables (cucumbers and tomatoes), and soup around meal time and as snacks to help to replenish their hydration. Try to strategically place a water bottle or cup next to their bed or favorite chair to help to remind them to drink liquids. Assist seniors throughout the day who cannot drink independently. Never leave home without a water bottle full of fluids. Monitor those with dementia closely, you may need to remind them to drink fluids and keep track of their consumption. Set a timer throughout the day as a reminder. Make an activity out of drinking with an afternoon tea service, iced drinks on the outdoor patio, have them cut up and mix fresh fruit into water jugs, or blend them up a mocktail or smoothie complete with a fun paper umbrella and fresh fruit. 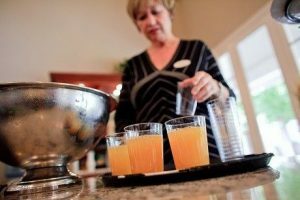 If your mom or dad is in an assisted living community, make sure the facility has a hydration program in place. At Aegis Living, we provide hydration stations with flavored waters to quench our resident’s thirst. We provide afternoon smoothies as a tasty way for our residents to make sure they are drinking a healthy amount of liquids. Coffee, tea, and beverages are always available to our residents, staff, and visiting family members throughout the day. And we keep an extra close eye on our residents during the warmer months and those with dementia who may forget to drink enough water.